The much-maligned provision in Obamacare that forces religious employers to provide contraception, abortifacients, and sterilization procedures to their employees should concern us all. But there is a silver lining, I suppose. After the Department of Health and Human Services issued its final regulations last summer, they offered a (nominal) olive branch to the Catholic Church: some non-profit organizations won’t be forced to comply with the HHS mandate until…January 1, 2014. Now, however, the U.S. Conference of Catholic Bishops is letting their grievances known (once again), informing Team Obama they can never, in good faith, support such a liberty-crushing law. They'll pay the fine instead. The nation’s Catholic bishops have a message for President Barack Obama: They would rather pay fines, no matter how much they would be, before they comply with the HHS mandate that compels groups to pay for birth control and drugs that may cause abortions. 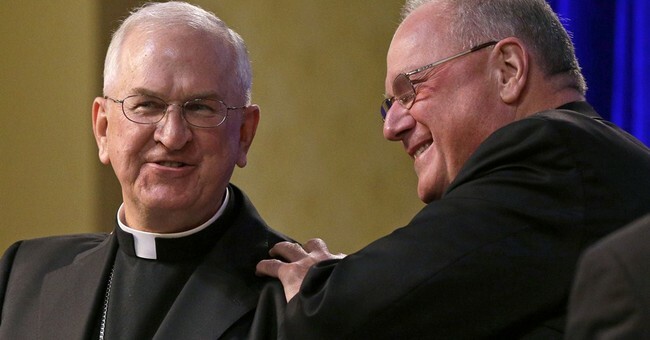 The U.S. Conference of Catholic Bishops today issued a “Special Message” at the conclusion of their fall General Assembly, November 13, in Baltimore. They unanimously passed the special message, which can only be issued as such meetings and strongly condemned the HHS mandate. “Beginning in March 2012, in United for Religious Freedom, we identified three basic problems with the HHS mandate: it establishes a false architecture of religious liberty that excludes our ministries and so reduces freedom of religion to freedom of worship; it compels our ministries to participate in providing employees with abortifacient drugs and devices, sterilization, and contraception, which violates our deeply-held beliefs; and it compels our faithful people in business to act against our teachings, failing to provide them any exemption at all,” they said. “Despite our repeated efforts to work and dialogue toward a solution, those problems remain. Not only does the mandate undermine our ministries’ ability to witness to our faith, which is their core mission, but the penalties it imposes also lay a great burden on those ministries, threatening their very ability to survive and to serve the many who rely on their care,” the bishops added. The Catholic Church supports universal health care coverage. Too bad the powers-that-be wrote off the U.S. Catholic Conference of Catholic Bishops, in part, by failing to amend a provision in Obamacare that basically forces religious Americans to violate their consciences. The Little Sisters of the Poor is a perfect example. Great strategy, guys. Incidentally, judging by the way things are going now, this whole thing might just implode on its own, taking the HHS mandate along with it. Now that would be a great victory -- especially for those who cherish religious liberty and freedom of conscience.